What's a boy to do when you have to "show and tell" a member of your family at school and the only person available is your cantankerous old Grandpa Frank? In The Frank Show, our young, unnamed narrator has a dilemma. He hears about all the cool, interesting family members his classmates are bringing in for show-and-tell, but all he can think about when having to talk about his grandpa is his mile-long list of complaints about the younger generation. This show-and-tell is bound to be a disaster... or is it? 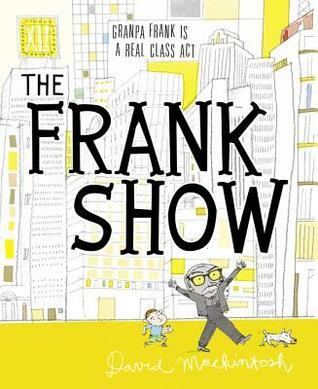 The Frank Show is a wonderful book for kids and teens alike that is full of humor while also tugging on your heartstrings. Everyone has members of their family whom they often say, "It's just grandpa" or "It's just mom" and fail to appreciate all of the wonderful pieces of them that have been overlooked by their singular view of that person. What David Mackintosh has set out to accomplish in this story is to help kids see past their myopic view of their family members and dig deeper into who they are as people, not just as mom, dad, or grandpa. Kristian's dad is a comedian on TV who makes everyone laugh. Paolo's mom is Italian and knows all about Italian and can speak Italian. Fay's cousin tells you if your bag's too heavy at the airport. Donny's dad works in a potato chip factory. Saul's aunt swam the English channel. Hugo's stepbrother has a sports car with an eight-ball gearshift knob. My grandpa's arm hurts when it's about to rain. I have never seen this book. It looks so adorable. Right to the TBR pile! Cookbook Review: The Chew: Food. Life. Fun.